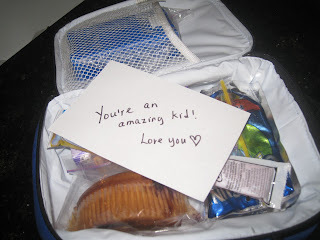 Just a simple note in your child's lunch bags can have a positive effect. Try it! I have been inserting post-it of love-notes in my kids’ lunch bags just to remind them that I do care and that I want them to be happy. I never knew whether they read them or not until recently when I heard my two little ones talk about it. It was one of those busy mornings – the precious 15 minutes before the school rush. The kids were having their eggs, toast, oatmeal and milk for breakfast. I just finished writing “You’re a Rock Star for being yourself. 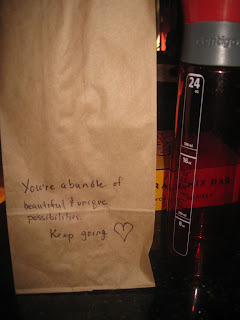 Keep smiling” on my 16yo’s brown paper lunch bag. I didn’t realize my 10yo read what I wrote. “Kuya Jonathon, you’re a rock star!” my 10yo said to my 16yo. My 16yo smiled ear to ear, and gave his little brother a big hug – which of course, made my 10yo happy! We had a great start. Perfect morning. I didn’t think my 16yo noticed what was written on his lunch bag until that afternoon. I believe in the law of cause and effect: every action will have an equal reaction. So I try to remind my children that the way we think about ourselves affect the way we feel. So I try to tell them to think of happy thoughts. There are negative thoughts, we do have them and they do haunt us. But what makes us happy is on how we focus on the positive. "While we teach our children about life, our children teach us what life is all about." what a great mommy you are!!! one of my best friend's is filipino & she tries to teack me tagalog & I try to teach her spanish, there are a lot of similiar words :) thanks for sharing your inspiration!! Thank you. I try to be a good mom -- hopefully just like my moms. Spanish and Tagalog have similar words, because Philippines was under Spanish rule for over 300 years. Thanks, Felicia. If I have the energy and motivation, I can probably create brown paper lunch bags with sayings. Sometimes surprise notes are more powerful. Thanks.